Last week’s blog focused on Pro Grip flooring as a perfect way to start building a signature look for your garage. However, there’s more to this than your floor. We love a stylish garage, and there are a number of ways you can take yours to another level. Here are some examples. Parts of last week’s blog on Pro Grip floor tiles were focused on the look of your garage, but why exactly are the visual aspects of this space so important to consider? The truth is that, whether it’s for work or part of your hobby, you probably spend a fair amount of time in your garage. Even when you’re not actively working on your vehicles, every time you enter the garage to take that classic car for a drive, the feel of the space it’s stored in helps set the tone for how you enjoy the vehicle itself. With a great-looking garage and a beautiful vehicle, the experience is truly complete. Let’s start with lighting, as it’s one of the most important elements of any space. For a garage, some might opt for a more general-purpose source of light that is stylish but isn’t held down to any one design or another. For this, strips of LED neon are an excellent choice. They’re energy-efficient, vibrant, easy to install, and highly durable. Others might be more into a classic look, such as vintage-style car logos, gas station branding, highway signage, or other automotive imagery. When it comes to this, you can’t go wrong with traditional neon signage. It’ll add a fun yet classy atmosphere to your garage that’s hard to beat. Aside from lighting, another key ingredient to a great garage is how you furnish it. Of course, the most important thing to furnish your garage with is high-quality equipment, but beyond that, sometimes it’s necessary to jazz things up a bit. This is especially true if you have a rec room. If you want to create a laid-back and classic feel, few things do it better than classic car furniture. Whether it’s a coffee table, a couch, or a single seat, there is a wide range of furniture modeled and themed after Corvettes, ‘56 Chevys, Mustangs, and other timeless vehicles. Explore and find what speaks to you! 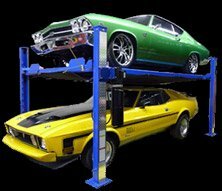 From garage gear to the highest-quality auto lifts in town, Lift King can provide you with some of the most important elements of any commercial or residential garage. Not only this, but we’re dedicated to only the highest standard of service. Call (403) 283-1020 and we’ll be there to help!